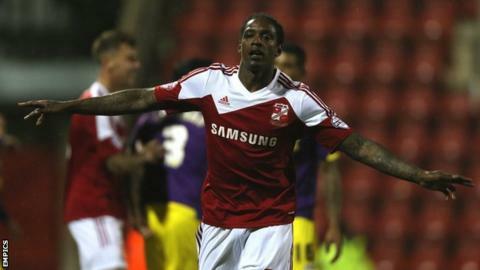 Championship side Blackpool have signed former Newcastle and Swindon striker Nile Ranger on a one-year contract. Ranger, who has also had loan spells at Barnsley and Sheffield Wednesday, was not named in the squad for Saturday's Championship game with Blackburn. The 23-year-old scored 10 goals in 28 appearances for Swindon last season but had his contract terminated in May after a number of disciplinary issues. Blackpool lost their first two games of the season without scoring a goal. A 2-0 defeat by Nottingham Forest in the Championship was followed by a 1-0 League Cup loss at League Two club Shrewsbury.